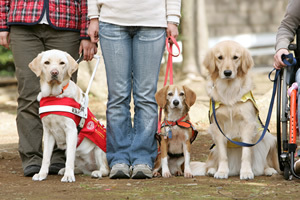 The New Access Law for People living with Service Dogs Has been approved in Japan!! Concerning service dogs, Japan is a late comer to the scene. However, after our newest service dog, assistance dogs for mobility work was introduced and the medical professionals became interested in them as a new assistive technology for Persons with Physical Disabilities, there have been many developments in this area in the last 15 years in Japan. The good thing about being a late comer in this area is that the fact that there are many good and bad examples in the world to learn from. The “Act on Assistance Dogs for Persons with Physical Disabilities” was passed by the Diet on May 22, 2002, and has begun to be enforced from October 1, 2002. This is an access law for Persons with Physical Disabilities who live with service dogs. The service dogs the act pertains to are Guide dogs, Hearing dogs and Mobility-service dogs. For those service dog users wishing to visit the country this is an important aspect of the law that must be kept in mind. Access is given only to the users and dogs that have passed the official government sanctioned certification process. Ministry of Health, Labour and Welfare (MHLW) created the English version of the Assistance Dog portal site in the MHLW site. The outline of “the Act on Assistance Dogs for Persons with Physical Disabilities” and other relevant information are published on the site. 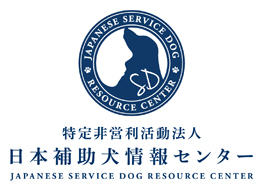 We would be happy if the site is useful for the foreign assistance dog users visiting Japan. This law aims at clarifying the responsibilities of both service dog users and trainers, and provides access to service dog users in public facilities, transportation and any other public places that citizens can use. The objective is to promote the social participation and independence of Persons with Physical Disabilities through facilitating the use and training of service dogs. Service dogs for Persons with Physical Disabilities are defined as guide, hearing and mobility-service dogs. (1) In national and local public bodies, public transportation and those facilities accessible to many and unspecified persons, the administrators of such must not deny entrance to service dogs whenever service dog users utilize those facilities. (2) Public transportation must provide access to Persons with Physical Disabilities traveling with service dogs. (3) In case of utilizing those facilities with a service dog, Persons with Physical Disabilities should carry on their person at all times official certification indicating that the service dog has been trained especially for the individual. (2) The Minister of Health, Labor and Welfare shall designate juridical persons for public service and juridical persons for social welfare involved in training or research, that can perform the responsibility of certifying service dog. (3) Concerning the dogs trained as a service dog and applying for　certification, the designated official juridical bodies should certify the dog if there exist no issues toward other human beings and the dog has abilities to act appropriately in public. The Act and Law shall be put into force on October 1. 2002.Concerning 4(1), however, this will come into effect In April 1. 2003. And 3(1), “administrators of facilities used by unspecified　persons”, This shall come into effect October 1. 2003. Copyright(C) 2015-2018 Japanese Service Dog Resource Center.